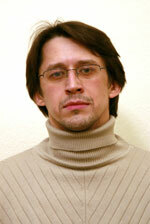 Born on February 2, 1975 in the village of Bograd, Krasnoyarsky Region, USSR/Russia. Education: 1991-1997 – Novosibirsk State University, Humanitarian Faculty, Department of history. Diploma of “Historian”. 1997-2000 – Novosibirsk State University, Humanitarian Faculty, Department of history. Post-graduate course. Ph.D. Thesis: The Early History of the Institute of 'Khentiu-she' in the Old Kingdom Period of Egypt [Ранняя история института хентиуше в Египте эпохи Старого царства]. St Petersburg 2000. 296 p. (typewriting). The synopsis of the thesis was published as a separate booklet: St Petersburg 2000, 25 p.
Academic Positions: From 2001 up to present – researcher at the Institute of Institute of Oriental Manuscripts (former St Petersburg Branch of the Institute of Oriental Manuscripts) of the Russian Academy of Sciences. At the moment Dr I.Bogdanov works on his Habilitation Dissertation. Major Research Interests: Egyptian language. Administrative History of Egypt during the Old Kingdom, etc. Languages: Egyptian, German, English, French, Russian.